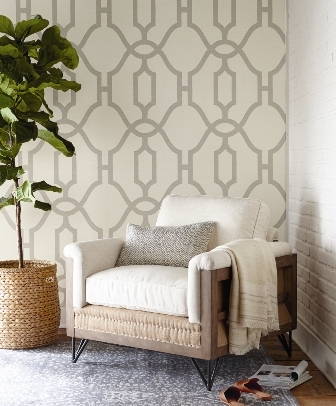 Magnolia Home Vol 2 Woven Trellis Wallpaper - Mullers Paint & Design Co. The price shown is for double rolls. Wallpaper has a 1-3 business day handling time and will ship via UPS Ground to the United States. If you need it faster or would like to order a sample please contact us before ordering. A striking and familiar pattern, this trellis design connects any indoor space with a sense of outdoor luxury. DISCLAIMER: Above dimensions do not account for waste from matching up as you hang the paper. The longer the repeat the more waste you will have. It is suggested that you order enough to complete your job. However if you run short please note the run# in the order notes.